Under Roman rule, funerary customs in Egypt changed even more rapidly and began to incorporate influences from Classical art. 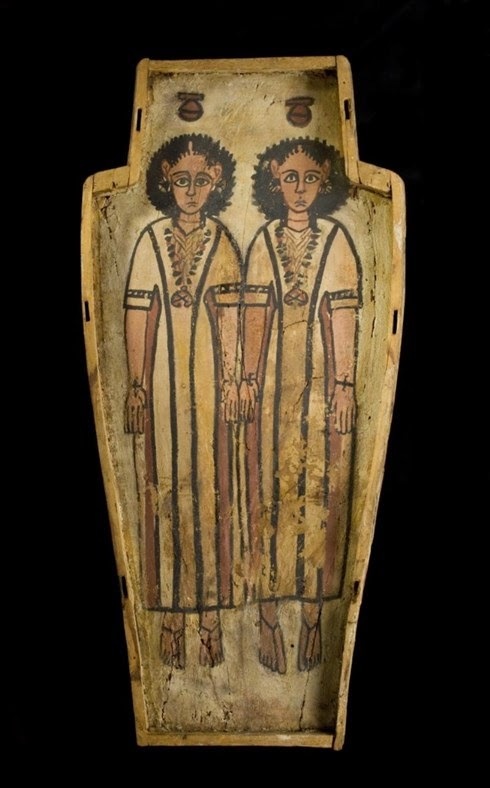 This unique double-coffin was used to bury two young half-brothers. The interior of coffins often depicted an image of the sky-goddess Nut, who was thought to protect the deceased. This coffin has two images of the goddess, one for each child. In Egypt, it was only following the introduction of Christianity that the process of mummification finally began to die out. The mummies of the boys were prepared with the utmost care and elaborately wrapped, indicating high status in their society. It is not known why the boys died so young but we know from papyrus left with the mummies, that they had the same father but different mothers. The boys' death highlight a sad aspect of the ancient world where young children were very likely to die. Tragedies such as disease devastating a whole family were all too frequent.